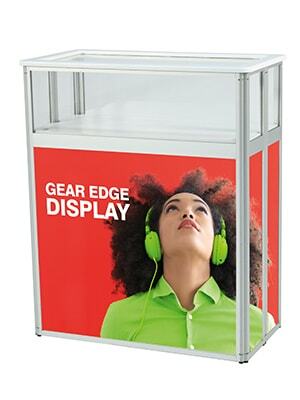 Complete your Gear Edge exhibition panel display with a choice of three counters. Straight, Curved or Display. Display Counter is a clever unit that has a clear acrylic top section with a 5mm foam board shelf to display your items. 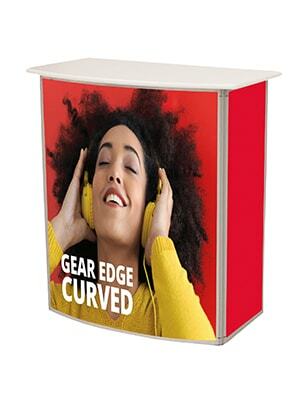 Complete your Gear Edge exhibition panel display with a choice of three counters. Straight, Curved or Display. Curved Counter has a curved front edge thermoformed table top in a choice of colours with one shelf and open back, plus bag. 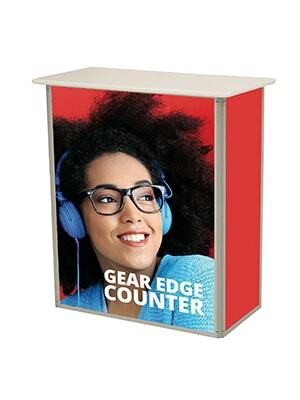 Complete your Gear Edge exhibition panel display with a choice of three counters. Graphic panels are very easy to change depending on your promotion or message.